We are delighted. This is our NUMBER ONE Polish cider so far. It is also first cider with cinnamon we have ever tried. This is a very good commercial cider: clear and very refreshing with a hint of cinnamon. You can drink it chilled or warmed (with cloves or ginger). It tastes like aromatic home made apple pie (or like Polish vodka Żubrówka known as Bison Grass Vodka). It is slightly fizzy. We strongly recommend this cider. We cannot wait to drink it again. 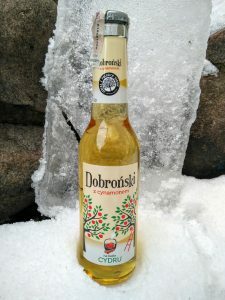 Let’s say goodbye to winter and drink Cydr Dobronski with cinnamon (also known as “Winter Cider”).